Ergonomic chairs are vital by serving as a foundation for the body when sitting. While the human body is flexible and can assume a variety of positions, it can only maintain them for a certain amount of time before discomfort is experienced. The sitting position is one that people assume most of the time, whether at work, home, or school. Without proper posture, discomfort or even serious health issues can arise. Back Pain – Back pain is the first and most common effect of an improper sitting posture. If slouching, some muscles in the back get stretched for a long period of time. When body weight is applied to these muscles, it can cause injury and some areas to feel painful. The pain could also be caused by sore muscles due to overexertion. Small support muscles along the spine help balance the body without necessarily bearing a lot of weight. They do correct posture for proper weight distribution along the body’s center of gravity. When sitting improperly, the muscles are over stressed and become sore. Poor Circulation – Sitting improperly can also cause poor circulation. The body is made up of a network of arteries and veins serving as passageways for blood circulation via this flexible tubing that runs all over the body. With ergonomic chairs, these small passageways operate at optimal blood volume capacity. When the body is sitting improperly, these passageways can become narrower, reducing the flow of blood to other body parts, causing numbness, loss of sensation and even pain in the affected area. Poor Oxygenation – Improper positions can also result in poor oxygenation. The lungs expand and contract to accommodate the volume of air coming into the body and to do this the abdomen has to have plenty of space for the diaphragm to move. Improper sitting positions like slouching or leaning on the side of the body can apply pressure on the abdomen, restricting the movement of the diaphragm and resulting in shallow breathing. As a result, the body cannot take in or dispel the right amount of air the body needs causing the diaphragm to work harder than it needs to. Ergonomic seating helps to maintain a proper sitting orientation, thus preventing common problems that accompany bad posture. Unlike regular chairs, an ergonomic version has customizable features to accommodate individual user proportions and can affect health problems, some of which are mentioned below. Height Adjustment – The height adjustability of a chair is important so a user can reach the right working height without having bending knees or dangling legs. This solution avoids nerve compression or restricted circulation. It also elevates a user’s line of sight to a proper height in order to avoid neck pain. Back Rest – Ergonomic chairs are also equipped with tensioned back rests to provide freedom of movement while maintaining proper back alignment. Most back supports are also curved to maintain the natural curvature of the spine. This option prevents pain caused by improper sitting positions, promotes the proper use of support muscles, and prevents improper body positions. Arm Rest – The arm rest is another important feature that helps maintain an optimal breathing cycle. The arm rests serve as support against leaning forward, allowing users to comfortably rest the arms instead of slouching forward, relieving the abdomen of extra pressure, and thus maintaining optimum air volume. Ergonomic furniture isn’t made just for aesthetic purposes; it also has practical uses and even health benefits as well. By maintaining a proper body position while sitting, an ergonomic chair can relieve chronic pain caused by improper postures. These innovative pieces of furniture might be a great solution for those individuals who need some relief from chronic pain! 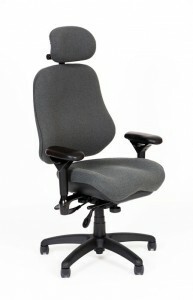 The Ergonomic Chairs Store Has the Ergonomic Seating Your Back Needs! Have you ever wondered about the difference ergonomic seating could make on your daily work routine? Give Ergonomic Chairs Store a call at 979-217-3044 to learn more about how your quality of life can be improved by furniture that is designed for you!